Just a little quickie here to jump start the week: TJ's Mango Mango Mochi. As if you haven't heard the word "mango" enough these past couple weeks, TJ's just had to squeak it into the title of this product not once, but TWICE. I guess it's because they use mango sorbet as well as mango jam filling. The jam doesn't really seem like a separate flavor to me at all—but it might add a hint of extra creaminess to the center of the mochi even when it's frozen solid. Otherwise, these are almost exactly like the Mango Mikawaya Mochi that Trader Joe's has carried for years. Now I'm not going to say this stuff is Mikawaya brand, because I couldn't tell you if that's the case for sure, but I will say that it's extremely similar in taste and texture. Actually, now that I think about it, Mikawaya is based in California and this product is imported from Thailand, according to the box. So...probably not Mikawaya. 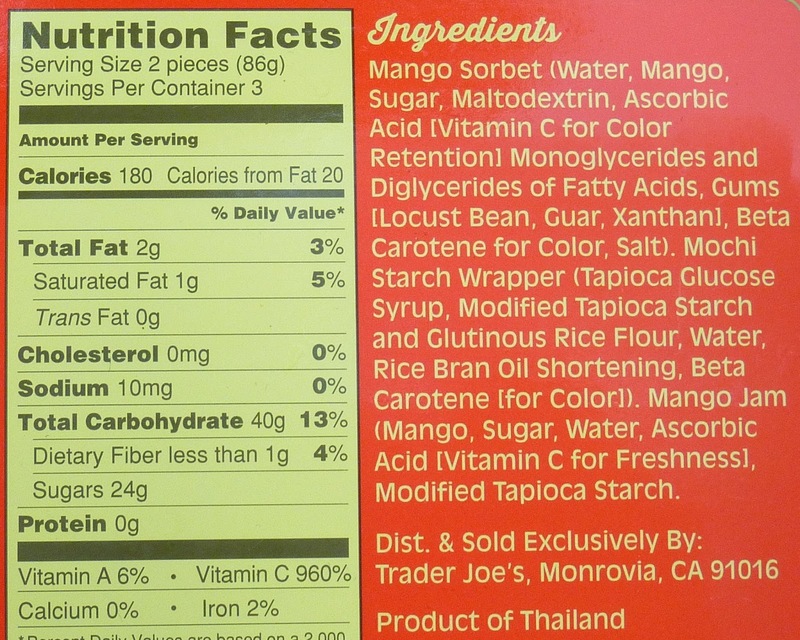 This product has a great mango-esque flavor, but it is particularly sweet—which is totally fine by me, but then again, I do have a sweet tooth. Mochi and mango are generally a pretty good combo...well, okay, there was this one instance where they were a little goofy together. I'd probably still choose vanilla or strawberry flavor first, but by and large, mango and mochi are friends. Four stars from me. Sonia will go with three and a half. After hitting up and devouring a box of the mango macaroons (sp? 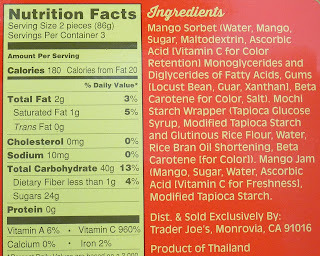 ), I have to get on board for some of these other mango goodies. The macs were top notch. I liked it. I love sorbet and this was a perfect bite and the jam gives a nice touch. I hope that they come out with peppermint mochi. Why not cookie butter mochi?! Yeah...why NOT cookie butter mochi? 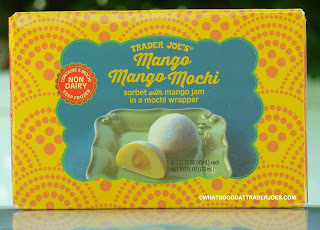 If I bribe the authors with a Trader Joe's gift card will the Mango Madness reviews stop? Lol. I loved these!! Nice smooth and intense mango flavor. Just one makes the best little dessert- and they're actually vegan! It's rare to find a dairy free mochi anywhere so I'm thrilled. I enjoyed them a lot but I loved seeing them dairy free as well.